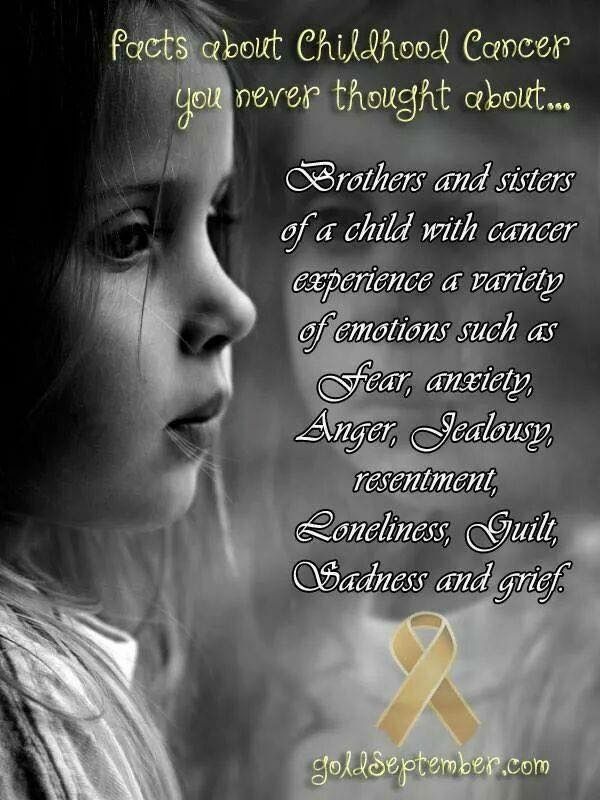 Being a sibling of a child with cancer can be very scary and confusing. Family dynamics change, schedules are unpredictable and schoolwork and activities can start to fall through the cracks. Many parents of children battling cancer express guilt that their healthy children are unintentionally overlooked while they are forced to focus on their sick child’s immediate needs. Apart from the fact that one of the parents, usually the mother, is either absent from the home for days weeks and sometimes even months at a time as she is at her sick child’s hospital bed, even when everyone is at home, dealing with a child with cancer and all that goes with that is time-consuming and exhausting. This is even more difficult in single-parent families (as many of our childhood cancer families are). Many mothers have expressed to us that their other children have become very naughty and often rude to them and/or ignore them completely as they are jealous of the attention given to their sibling and the fact that their mother is hardly ever around to pay attention to them, misses school activities etc. There is no way to consistently balance the attention you give to your children when one is fighting cancer, but there are a few simple ways to make sure that all your children feel important, even during such difficult times. Keep their routine as consistent as possible. During stressful or scary times, it is especially important for a sibling to feel like they have a routine, and for others to help them keep that routine consistent. If possible, ask a parent of their friend or classmate to drive them to and from activities after school so they can keep that part of their lives steady in the face of uncertainty. 1. Help celebrate their accomplishments. Often, siblings of childhood cancer patients may try to silently sink into the background to avoid taking attention away from their sick sibling. If you know they’ve done something special, like aced a test or performed in a school play, do a little something to show them they’re noticed and appreciated. Enlist your friends and family to keep a look out for ways to celebrate your child, especially if you know you’ll be particularly busy. 2. Pre-package some snacks or meals to have around the house. When parents are constantly back and forth from the hospital, food at home can become scarce. If you know you’ll be busy going to and from appointments with your child fighting cancer, try to prepare by packaging some easy-to-grab meals, school lunches or snacks for siblings still at home. 3. Set a time for a parent/sibling date. It’s important for a sibling of a child with cancer to spend some time alone with their parent. If you can, set a time when you can see a movie or cook a meal together, just the two of you. Ask another family member or friend to take over care-taking duties of your child fighting cancer for a few hours so you can give their sibling your full focus. This can help you catch up with what’s going on in their world, and help you both escape the cancer universe for a brief time. 4. Seek out resources for siblings. Find out if your child’s hospital or care facility offers any programmes and/or resources specifically for siblings of childhood cancer patients. Programs like this help siblings meet others in similar situations, and also give them time to just be a kid for a while. Nobody is perfect, and when childhood cancer gets overwhelming, parents can only do so much. Any tiny ways you can recognise your children for being resilient during this time can make a huge difference. Ask for help where you need it, accept yourself for not being perfect and take things one day at a time.